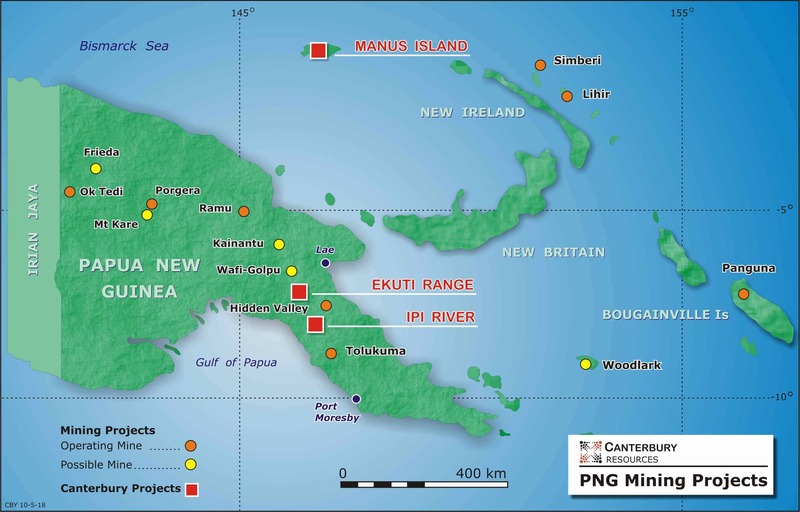 In PNG Canterbury has three projects; Ekuti Range and Ipi River on the mainland, and Bismarck on Manus Island. PNG is renowned for its abundant mineral wealth, including world-class copper and gold assets. Its unique geology largely results from its position on the interactive plate tectonic boundary between the cratonic Indo-Australian plate to the south and the oceanic Pacific Plate to the north. Since the Cretaceous, uplift and deformation has occurred because of collision between these plates. On mainland PNG, which hosts the Ekuti Range and Ipi River projects, porphyry and epithermal style mineralisation occurs associated with two spatially and temporally distinct magmatic arcs. The early Maramuni arc (mid-Miocene age) was active in the northern part of mainland PNG and deposits such as Freida River and Yandera are associated with this arc. A much younger arc is associated with high level intrusions and extrusive volcanism in central and southern PNG, and the Ok Tedi, Porgera, Wafi-Golpu, Hidden Valley and Tolukuma deposits are associated with this arc. Strategic tenements have been established in a well-endowed mineral province. 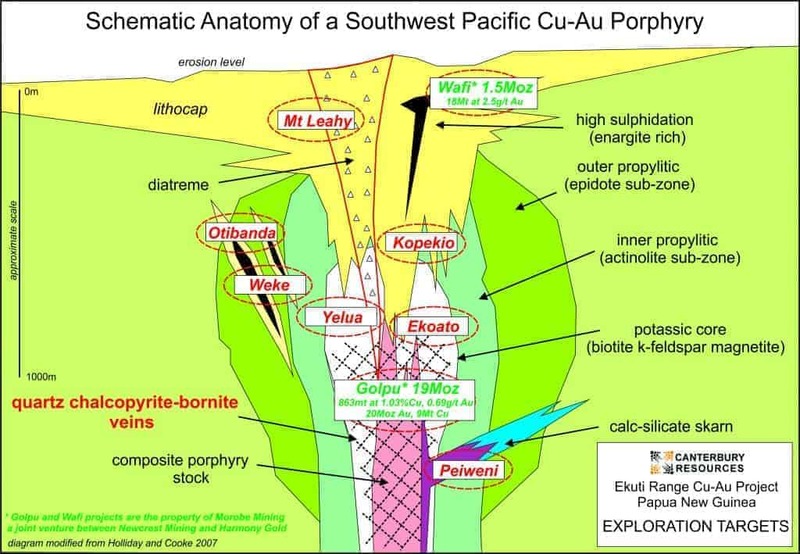 Epithermal gold rich lodes have been identified, overlying interpreted large scale, metal rich copper-gold porphyry systems. This large tenement covers a sparsely drilled porphyry copper-molybdenum- -gold system, with compelling, untested IP targets. 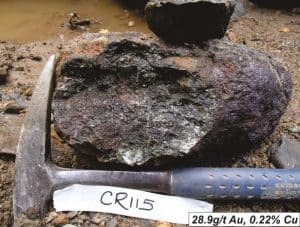 Through a combination of geophysical surveys, geochemistry and geological interpretation, project manager Rio Tinto has identified potential large-scale buried porphyry copper-gold targets that are yet to be drill tested. 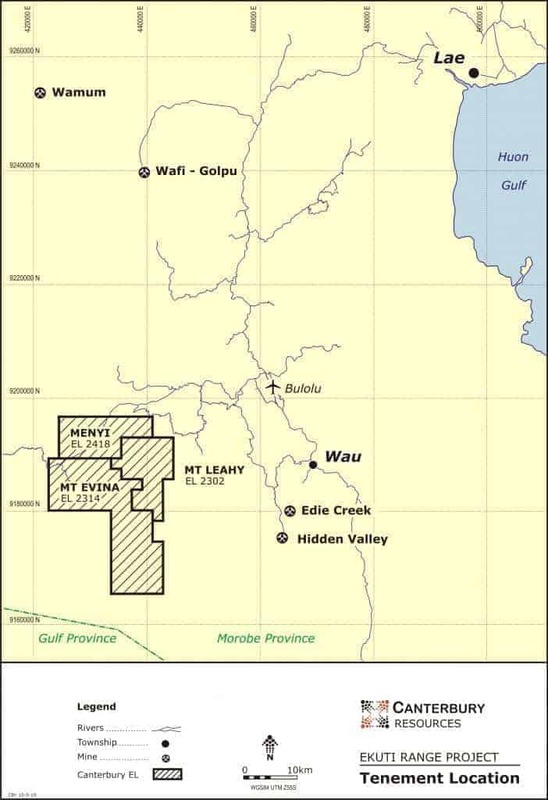 The 100% owned Ekuti Range Project [EL2302 (Mt Leahy), EL2314 (Mt Evina) and EL2418 (Menyi)] in Morobe Province PNG is in a well-endowed metallogenic belt that hosts world class epithermal and porphyry style deposits, including the Hidden Valley gold mine (2017 Mineral Resources 8Moz gold) and the Wafi-Golpu project (2017 Mineral Resources 26Moz gold, 8.8Mt copper). The Project has reasonable access to infrastructure by PNG standards, being approximately 20km south west of the regional town of Bulolo (a former mining centre and now a hub for forestry) and 80km south west of the major port city of Lae (PNG’s second largest city). The Menyamya Road, which links to Lae, crosses the north-western portion of the tenements within the Menyi license area. The Mt Leahy and Menyi tenements lie within the Ekuti Dividing Range which reaches heights of up to 3,100m. The Mt Evina tenement adjoins to the south and west, and covers the western foothills of the range. The western side of the range is drained by the Kapau, Kariba and Indiwa Rivers which drain to the south to the Gulf of Papua. The eastern side is drained by the Watut River, which discharges into the Huon Gulf at Lae. Surprisingly, since discovery of the Ekoato and Otibanda prospects by CRA in the late 1980s, relatively limited exploration has been conducted in the Ekuti Range area. Triple Plate Junction (“TPJ”) investigated the area from 2006 to 2013 focusing on high grade Cu-Au lodes at Otibanda, Weke and Sepanda (Kopekio). Limited shallow drilling returned encouraging results e.g. 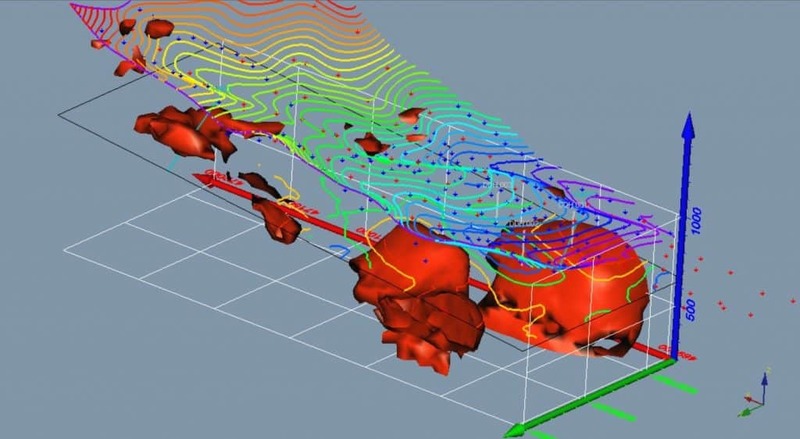 Newmont, in joint venture with TPJ, recognized that the lodes were porphyry related and completed airborne geophysical surveys (100m line spacing, heli-magnetics and radiometrics) in 2010 and 2011. However, they withdrew from PNG before undertaking meaningful ground follow-up based on interpretation of the data. Since the granting of its initial tenement in 2014, Canterbury has undertaken multiple investigative programs, including reconnaissance mapping, sampling, petrology and geophysical interpretation. Results have been encouraging, with widespread mineralisation encountered across multiple prospects. In part, this work has been supported by technical input from Anglo American and Rio Tinto. 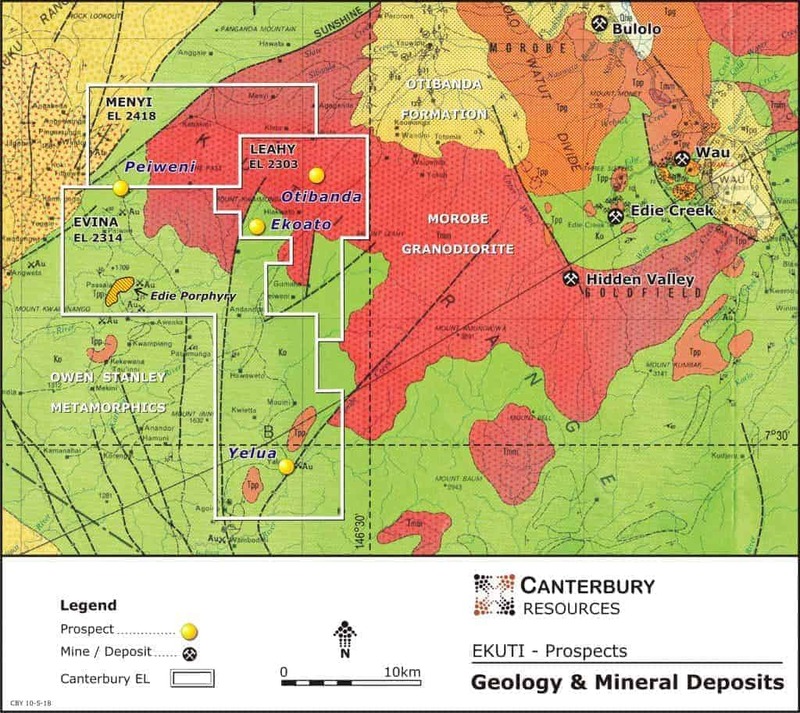 During 2014 Canterbury merged and interpreted the data from the Newmont magnetic surveys with existing regional survey data, identifying at least ten discrete magnetic anomalies of moderate to high amplitudes, about the size and geometry for the magnetite rich potassic core of a porphyry system. 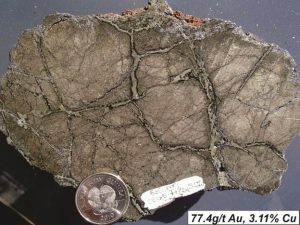 Similarly, petrological investigations at selected prospects suggests the causative quartz monzodiorite porphyry intrusives have clearly exsolved metal bearing fluids into enclosing rocks dominated by pyrite, pyrrhotite and chalcopyrite mineralisation. Field follow-up has been undertaken at selected prospects, with a representation of the relative position of the most advanced prospects illustrated on the following interpreted schematic section of a south west Pacific porphyry system. 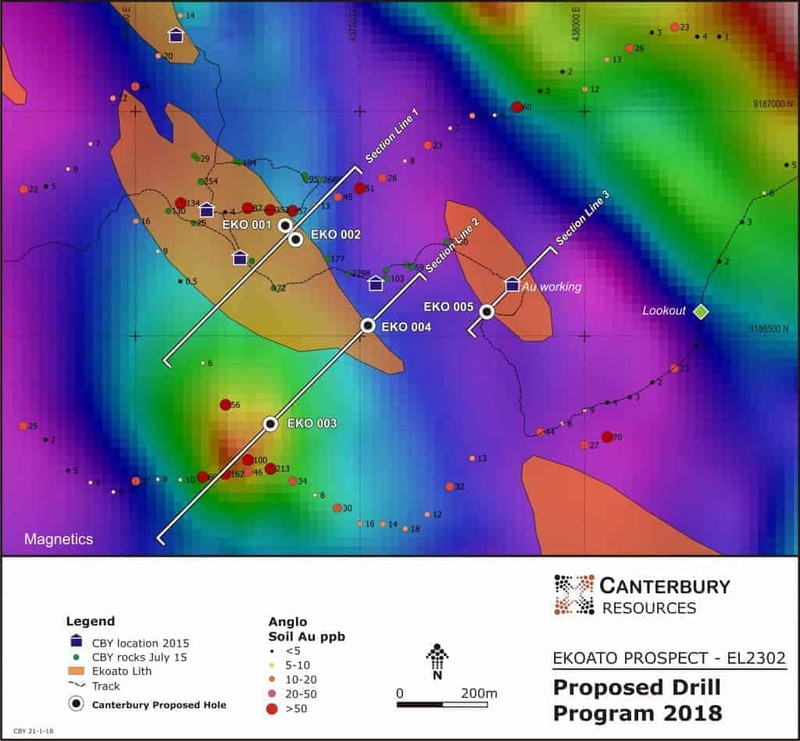 Within the Ekuti Range Project, Canterbury’s most advanced prospect is at Ekoato, where exposed tops of potentially large-scale porphyry systems have been interpreted based on alteration, veining and a high sulphidation covellite-enargite mineral assemblage. Additionally, age dating of intrusions at Ekoato suggest that it is comparable in age to the Golpu porphyry, located 60km to the north. Overall, the initial drilling phase at Ekoato will test an area of approximately 1km2 and provide valuable sub-surface geological information in what is believed to be the upper parts of an extensive porphyry copper-gold system. 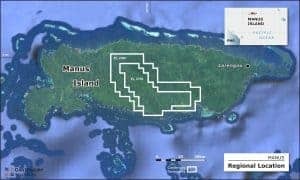 The Bismarck Project (ELs 2378 and 2390) is located on central Manus Island in northern PNG, some 830km north of Port Moresby. 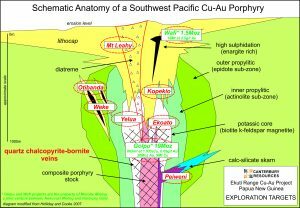 The tenements cover a porphyry copper and gold province that is 35km long and 7km wide, with the mineralised corridor having a north-west south-east orientation. Manus Island’s commercial centre, Lorengau township, is in the east of the island and has a regular air service to Port Moresby. The Bismarck EL’s were granted to Finny Ltd (“Finny”) in December 2015, and Finny was subsequently acquired by Canterbury in 2018. 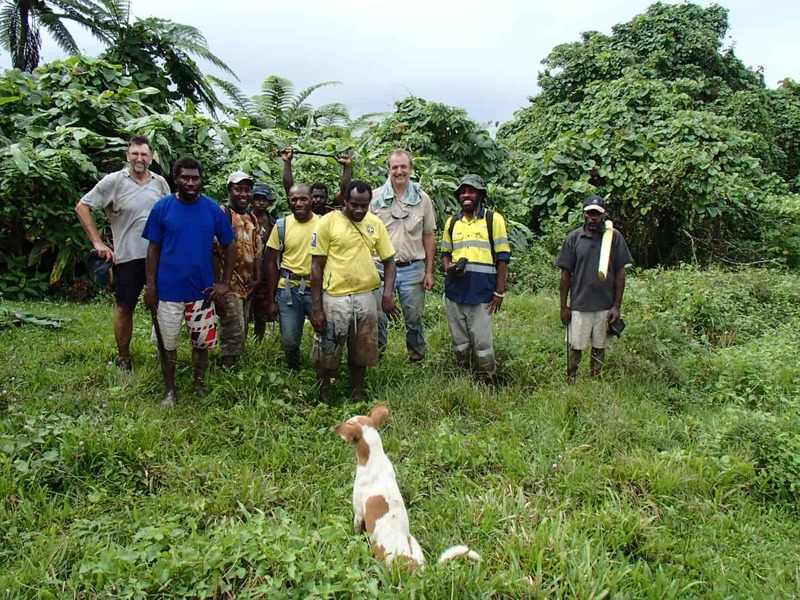 In September 2016 Rio Tinto Exploration (PNG) Ltd entered a Farm-In and Joint Venture Agreement (“JV”) with Finny whereby Rio Tinto has the right to earn equity in, and potentially acquire, the Bismarck Project. Under the JV, Rio Tinto has sole-funded more than A$5 million of exploration activity during the Initial Exploration and Stage-1 Exploration phases to earn a 60% JV interest in the Project. If Rio Tinto completes the Stage-2 Exploration phase, including sole-funding a further $12.5 million of exploration activity, it will increase its JV interest to 80%. Geologically, Manus Island is part of a dismembered volcanic arc on the Pacific Plate. The oldest exposed rocks are mid-Eocene to early Miocene volcanic rocks with calcareous interbeds and limestone lenses. 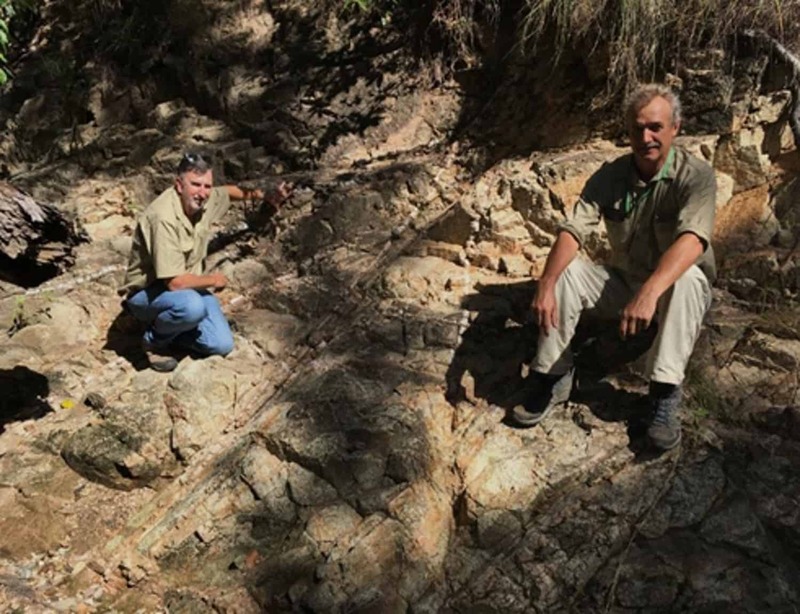 Renewed volcanic activity is marked by the deposition of the Tasikim Volcanics, considered to be the extrusive equivalents of the large, early to middle Miocene multiphase quartz monzodiorite of the Yirri Intrusive Complex. All copper and gold mineralisation on Manus Island appears to be genetically related to the Yirri Intrusive Complex. Preserved roof pendants within the Yirri Intrusive Complex are typically intensely brecciated and pyrite-silica-alunite altered, characteristic of high-sulphidation epithermal systems. 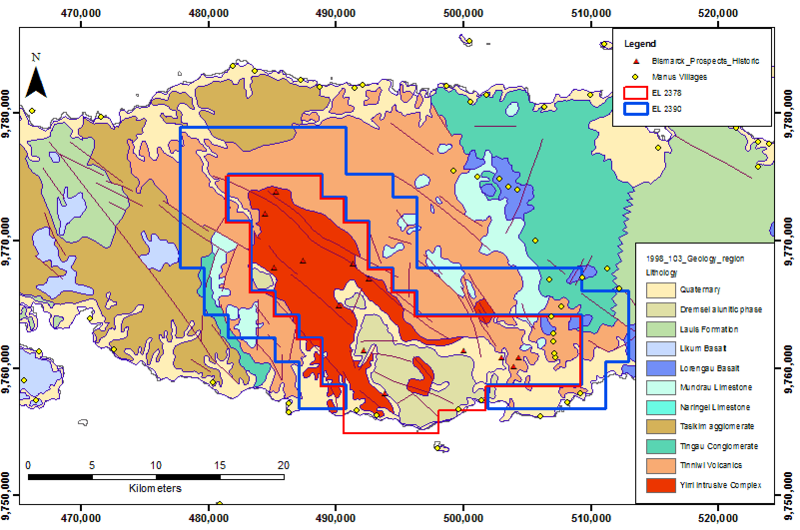 Elsewhere hydrothermal alteration is more typical of deeper-seated porphyry copper mineralisation, and in the southeast of the mineralised corridor low-sulphidation epithermal vein and limestone replacement mineralisation occurs. The region has undergone extensive and locally intensive early stage exploration over the past 50 years, including more than 5,000 stream sediment samples, 1,500 rock chip samples, 6,000 soil samples and 102 diamond drill holes. However, historical drilling has failed to delineate any economic deposits. Two main mineralisation styles are recognised, with strong potential for a third. Potential high sulphidation copper-gold systems associated with extensive areas of silica-alunite lithocap. Recognition of extensive lithocap in the southeast of the ELs has significant implications in the ongoing exploration for porphyry mineralisation. Lithocaps, defined as zones of advanced argillic alteration, may form above porphyry systems and may host late stage metal-rich ore zones e.g. the Wafi gold deposit. Fertile lithocaps may also vector to concealed sizeable porphyry copper-gold deposits at depth e.g. the Golpu copper-gold deposit. Mapping has provided ample evidence of a well-developed advanced argillic lithocap. Re-interpretation of historical geochemical data has identified broad areas of coincident molybdenum, arsenic and bismuth over the lithocap area. Geophysics has identified buried potential porphyry style targets. 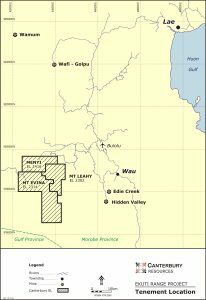 Rio Tinto’s geophysical activity commenced with a 786-line kilometre ZTEM survey, completed in March 2017. ZTEM (Z-Axis Tipper Electromagnetic) is an airborne audio-frequency magnetics system for electromagnetic surveying. 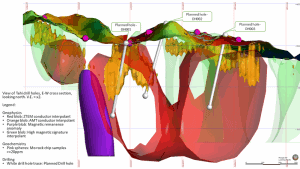 It utilizes the naturally occurring or passive electro-magnetic fields from worldwide thunderstorm activity as the source of transmitted energy, and is regarded as being suited to mapping deeply buried, porphyry hosted and structurally controlled deposits. The Rio Tinto survey identified three significant anomalies that warranted further work (Main ZTEM Anomaly, ZTEM Anomaly 2, and ZTEM Anomaly 3). 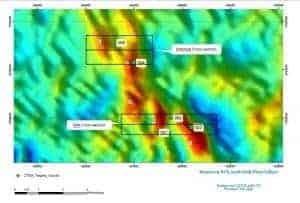 Evaluation of the Main ZTEM Anomaly concluded it was indicative of a resistive zone, interpreted as an intrusive stock, 500m in diameter with a conductive halo, interpreted as asulphide zone, and comparable in size and clarity to the anomaly associated with the Wafi-Golpu deposit. In late 2017 a 64-station Audio Magneto Telluric (AMT) survey was completed to verify the identified ZTEM anomalies. 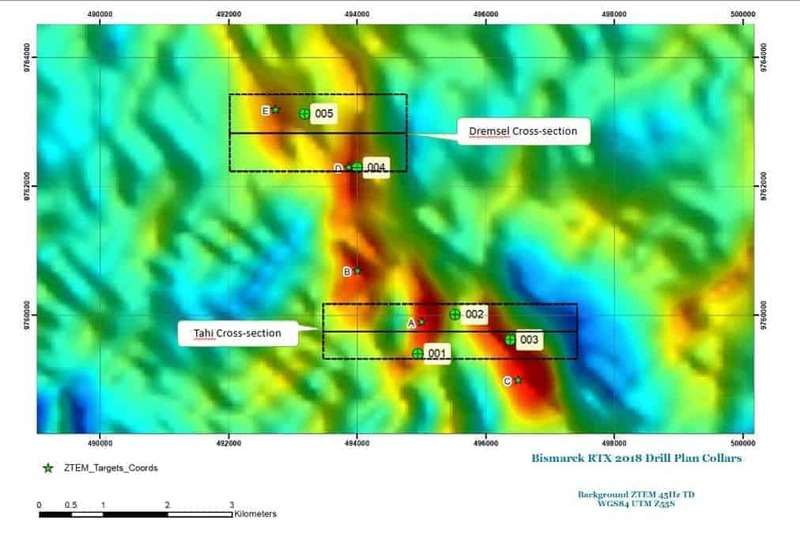 The AMT results suggested that the conductive (sulphide) targets are present at shallower depths than that suggested by the ZTEM alone, with the lithocap interpreted to be less than 100m thick in most of the priority target areas. Rio Tinto is proposing an initial diamond drill program of a minimum of 1,500m in three to five holes (DH001 to DH005) to initially test the Main ZTEM Anomaly area – an area that has not been previously drill tested. The program may be modified in response to initial results. Canterbury’s 100% owned Ipi River Project [ELA2509 (Tapini)] is located 150km north-northwest of Port Moresby in Central Province, PNG. 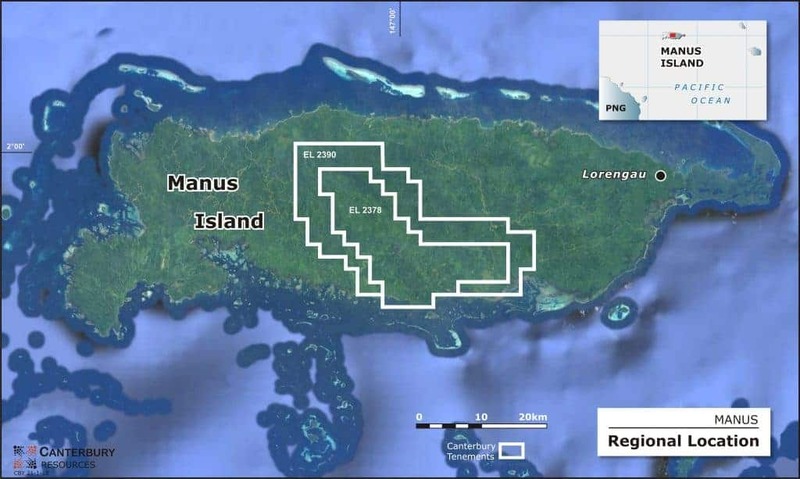 Immediately prior to Canterbury’s application, the area was held and explored by the PNG Government owned company Petromin PNG Holdings Limited (“Petromin”), which was exiting the exploration industry at that time. 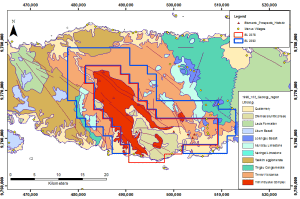 The Ipi River area was initially evaluated by CRA Exploration in the early 1970’s, with significant copper and gold mineralisation encountered in drainage sampling. 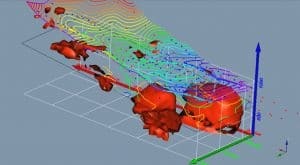 BHP subsequently explored the area between 1973 and 1976, drill testing a buried intrusive beneath a colluvial terrace, encountering significant intervals of low grade copper-gold mineralisation. Subsequent exploration by Emperor Mines included ridge and spur soil sampling, plus limited reconnaissance mapping and rock chip sampling. 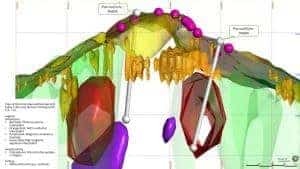 Petromin acquired the area in 2008, and completed further mapping and geochemical sampling, a 3D Induced Polarized (IP) survey and drilled three diamond holes to further test the BHP porphyry target at Ipi River. A best intercept of 366m at 0.17% copper, 0.1g/t gold and 120ppm molybdenum was reported from the drilling program. 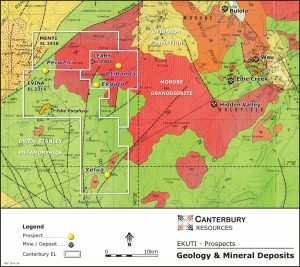 Canterbury applied for ELA2509, covering many of the historical porphyry copper-gold and epithermal gold-silver prospects in the region, including Ipi River, in November 2016. On the 7th February 2018 the Canterbury successfully completed the Warden’s Hearing which is an important step in the license assessment and approval process. Once granted, Canterbury will undertake a detailed reassessment of historical data, including the Petromin IP data, and formulate a detailed exploration plan. 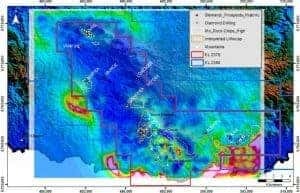 Preliminary interpretation of existing data indicates the presence of several strong IP anomalies that appear to be associated with significant near-surface copper mineralisation, which are yet to be drill tested.